With the recent rise in the popularity of the iPhone and other smartphones, we've been getting a lot of requests in our stores for handlebar-mounted phone holders. There are several products out there, and from the feedback we've gotten from some customers, they have nice features, but few have all of the perfect combination of features to make them "just right." We've done some research on other models that might fit the bill, but at a price (some over $60) that many consumers feel just isn't worth it. 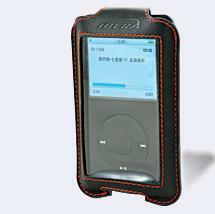 The first product that we stocked was the Ibera iPhone/iPod case. Topeak is one of our favorite manufacturers of bike accessories; we're big fans of their rear racks, trunk bags, handlebar bags, and fenders. They showed us their new iPhone Dry Bag at Interbike last fall, but it has only been available in very limited quantities for the past month or so. This case has a clear plastic window for an iPhone's camera lens; in our in-store tests, though, the pictures came out a little cloudy. 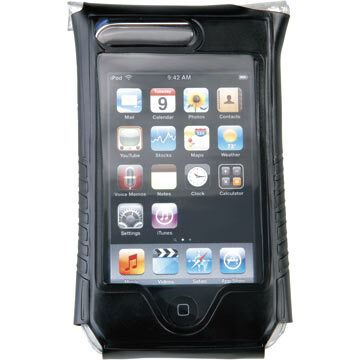 Somewhat tight fit; may work with some thin protective covers, but not with thicker silicone or rubberized covers. We recently received a sample of a new product in this category to try out. 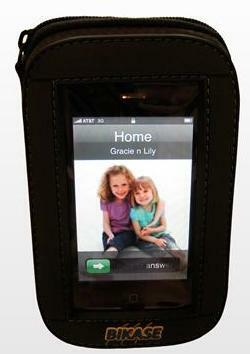 It's the BiKase Phone/GPS Holder, made by a company called Gear Grinder. To give this phone holder a real test, I tried this product out last week during a mountain bike ride at Mohican State Park. 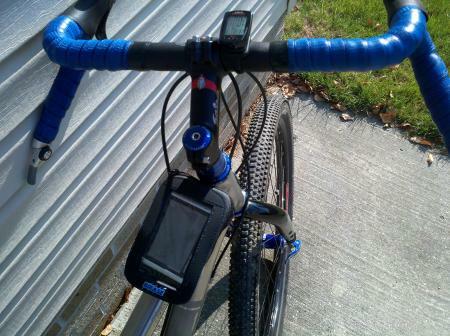 The BiKase mounts quickly and easily to your handlebar, stem, or frame using two Velcro straps. The straps have some stretch to them, so you can get a secure attachment regardless of how thick or thin the bar you're attaching them to is. This seemed to work well, until about 4 miles into the 25-mile Mohican loop. I rode over a few roots, and the BiKase got jostled so much that it bumped into my Cat Eye enough to make it pop out of its mount. I saw the Cat Eye flying on my right to the side of the trail, so I stopped immediately to pick it up. I searched through the weeds until the horseflies started going into dive-bomber mode, but never found my Cat Eye. I did, however, find a case of poison ivy on my leg two days later. I rode with this setup for a while, and it worked fine, other than occasionally brushing my knees against the BiKase when pedaling out of the saddle. Aside from the mishap with my Cat Eye, the BiKase worked well, and I'd still recommend it; just be careful how you strap it in place in relation to your bike computer. I was able to use my phone's touch screen with no problems, and my GPS tracking app continued to work accurately to map my route, even under the tree cover of the mountain bike trail. The BiKase has a roomy storage compartment that will work with a variety of devices: iPhone, Blackberry, Droid, or even automobile-type GPS units (which you can see acting as a stand-in for my phone in the photos above). The BiKase is not waterproof, but its thick neoprene skin does work well to protect your device against bumps. It also has a zippered opening and a headphone port, no camera port. 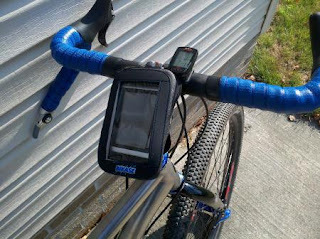 What features are most important to you in a smartphone holder for your bike? Have you tried any model of phone holder yourself yet? How well has it worked for you? We're interested to hear your feedback, so let us know in the comments to this post.